When Steve Smith set out to hitchhike from Sault Ste. Marie, Ontario to Canada’s west coast back in 1968, he was just an eighteen-year-old hippie with an appetite for adventure. But a short way into his journey, a reckless decision to steal a car landed him in police custody. Afraid of getting caught with the two tabs of acid in his pocket, Steve popped them into his mouth. It was one of the worst decisions of his life. Mistaking his drug trip for a mental breakdown, the authorities placed him in Ontario’s notorious Oak Ridge mental health facility. While there, not only did he find himself shoulder-to-shoulder with people like notorious child killer Peter Woodcock and mass murderers Matt Lamb and Victor Hoffman, he also fell into the hands of someone worse: Dr. Elliot T. Barker. Over the next eight months, Barker subjected Steve and the other patients to a battery of unorthodox experiments involving LSD, scopolamine, methamphetamines, and other drugs. Steven also experienced numerous other forms of abuse and torture. Following his release, Steve continued to suffer the aftereffects of his Oak Ridge experience. For several years, he found himself in and out of prison—and back to Oak Ridge—before he was finally able to establish himself as a successful entrepreneur. Once he began investigating what happened to him during his youth, not even Steve was prepared for what he would discover about Barker, Oak Ridge, and one of the darkest periods in Canada’s treatment of mental health patients. The question remains: Was Oak Ridge and Dr. Barker trying to cure psychopaths or trying to create and direct them? The British Psychological Society’s History of Psychology Centre, in conjunction with UCL’s Centre for the History of the Psychological Disciplines, has announced the next talk as part of its autumn BPS History of Psychological Disciplines Seminar Series. On November 24, Joel Eigen (above) of Franklin & Marshall College will be speaking on “Medical Testimony and the Dynamics of Forensic Diagnosis at the Old Bailey, 1760-1913.” Full details follow below. With the enigmatic diagnosis of Homicidal Mania, forensic psychiatric witnesses in late Victorian insanity trials introduced a form of mental derangement that for the first time excluded cognitive impairment. 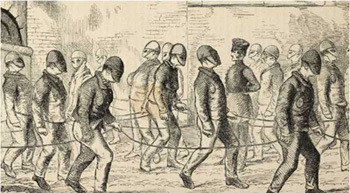 How medical men constructed a disease out of distracted volition and the role played by an administrative change that brought doctor and prisoner before trial is the subject for this talk. The research is based on a study of courtroom testimony given in 1000 Old Bailey insanity trials. Joel Eigen has written of the origins and evolution of forensic psychiatry in Witnessing Insanity, Madness and Mad-Doctors in the English Court (Yale, l993) and Unconscious Crime, Mental Absence and Criminal Responsibility in Victorian London (Johns Hopkins, 2003). He is currently working on the third and final book in this series, the subject of this seminar.